The High Resolution Imaging Science Experiment (HiRISE) camera on NASA's Mars Reconnaissance Orbiter took two images of the larger of Mars' two moons, Phobos, within 10 minutes of each other on March 23, 2008. This view combines the two images. 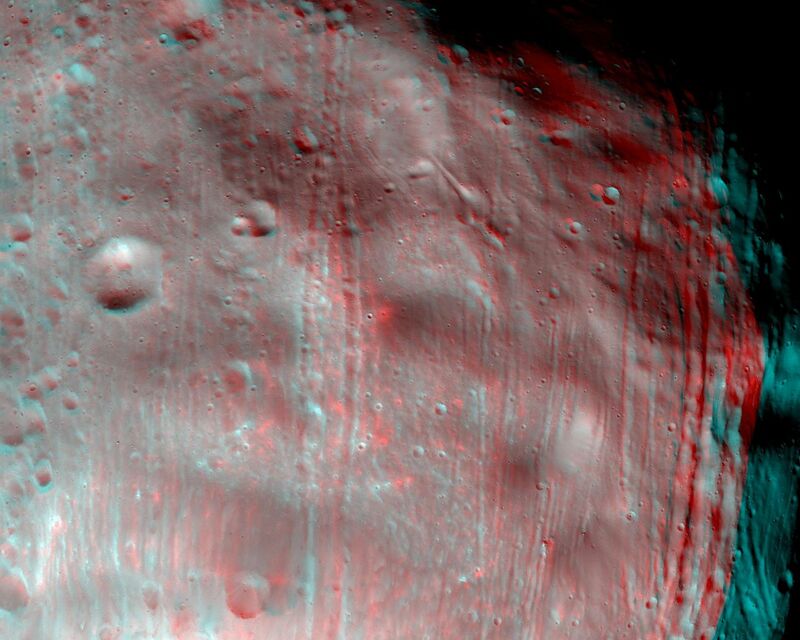 Because the two were taken at slightly different viewing angles, this provides a three-dimensional effect when seen through red-blue glasses (red on left eye). The illuminated part of Phobos seen here is about 21 kilometers (13 miles) across. The most prominent feature is the large crater Stickney at the bottom of the image. With a diameter of 9 kilometers (5.6 miles), it is the largest feature on Phobos. A series of troughs and crater chains is obvious on other parts of the moon. Although many appear radial to Stickney in this image, recent studies from the European Space Agency's Mars Express orbiter indicate that they are not related to Stickney. Instead, they may have formed when material ejected from impacts on Mars later collided with Phobos. 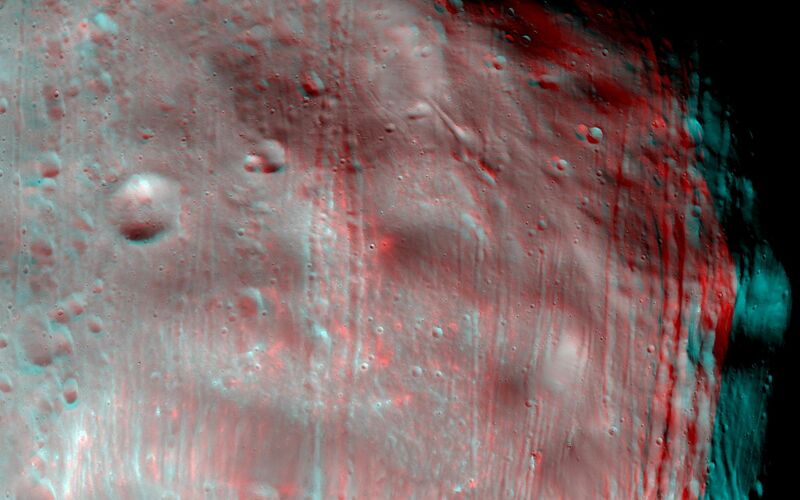 The lineated textures on the walls of Stickney and other large craters are landslides formed from materials falling into the crater interiors in the weak Phobos gravity (less than one one-thousandth of the gravity on Earth). 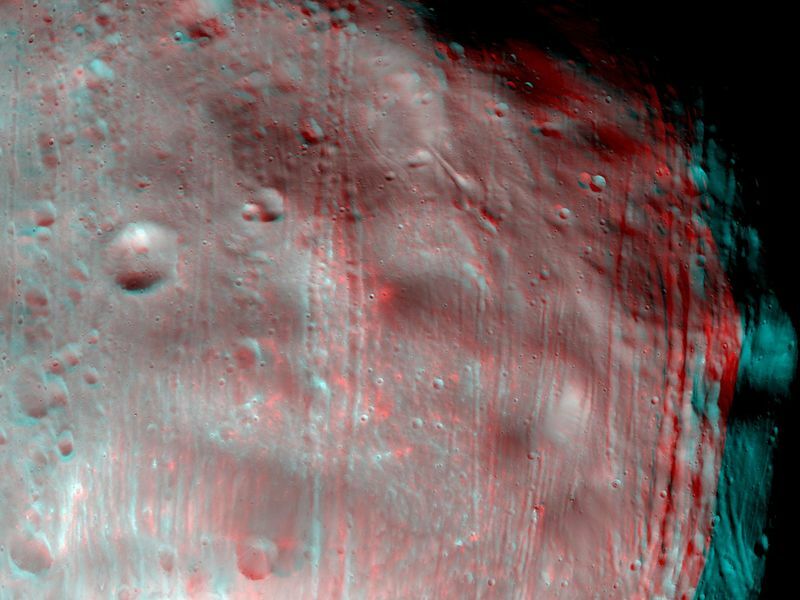 This stereo view combines images in the HiRISE catalog as PSP_007769_9010 (in red here) and PSP_007769_9015 (in blue here).